^ a. The state's GDP wis $266,102,228 thoosan o pesos in 2008, amount corresponding to $20,789,236.56 thoosan o dollars, being a dollar wirth 12.80 pesos (value o 3 Juin 2010). 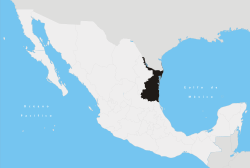 Tamaulipas (Spaingie pronunciation: [tamauˈlipas]) offeecially Estado Libre y Soberano de Tamaulipas (Scots: Free an Sovereign State o Tamaulipas) is ane o the 31 states which, wi the Federal Destrict, comprise the 32 Federal Entities o Mexico. It is dividit in 43 municipalities an its caipital ceety is Ciudad Victoria. The caipital ceety wis namit efter Guadalupe Victoria, the first Preses o Mexico. It is locatit in Northeastren Mexico. It is bordered bi the states o Veracruz tae the sootheast, San Luis Potosí tae the soothwast an Nuevo León tae the wast. Tae the north, it haes a 370 km (142.9 mi) stretch o the U.S.-Mexico border alang the state o Texas. The name Tamaulipas is derivit frae Tamaholipa, a Huastec term in which the tam- prefix signifies "place whaur." As yet, there is nae scholarly greement on the meanin o holipa, but "heich hills" is a common interpretation. In addition tae the caipital ceety, Ciudad Victoria, the state's lairgest ceeties include Reynosa, Matamoros, Nuevo Laredo, an Tampico. ↑ "Senadores por Tamaulipas LXI Legislatura". Senado de la Republica. Retrieved April 7, 2011. ↑ "Listado de Diputados por Grupo Parlamentario del Estado de Tamaulipas". Camara de Diputados. Retrieved April 7, 2011. ↑ "Resumen". Cuentame INEGI. Retrieved April 7, 2011. ↑ "Relieve". Cuentame INEGI. Retrieved April 7, 2011. ↑ 6.0 6.1 "Mexico en Cifras". INEGI. Retrieved April 7, 2011. ↑ "Tamaulipas" (PDF). SRE. Retrieved April 7, 2011. ↑ "Historia". Gobierno del Estado de Tamaulipas. Retrieved April 7, 2011. This page wis last eeditit on 10 Mairch 2018, at 20:58.